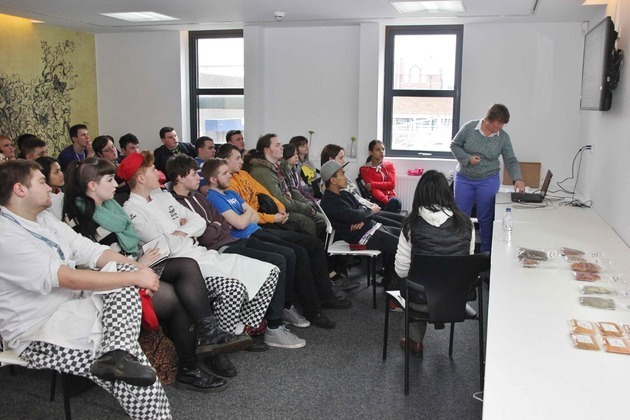 Kath Davis, new Product Development Manager at EHL Ingredients, based in Reddish, Stockport, visited the college on Wellington Road South to present an educational workshop on the history, classification and uses of herbs and spices from around the world. The interactive session showed the Food Technology class over 90 examples of herbs, spices and blends with the students learning about culinary and medicinal uses and benefits of the food ingredients. The session took place on Wednesday 11th February. EHL Ingredients is based in Reddish, Stockport and is an importer, blender and packer of food ingredients from around the world. From herbs and spices, to beans, pulses and dried fruit, it supplies over 300 food ingredients to all areas of the food industry, and boasts a 200-strong organic range as well as over 70 custom blends. EHL Ingredients’ products are used in foods such as breads and bakery items, ready meals, healthy snacks and soups and sauces.